sl:.-ht downward revision has been made in the 1937 estimate. wheat prices during the next few months. the rsmrall stocks on January 1, 1937. I s i a f;r. d C( i:rK. a. 1i mill i n bushels, tI carry--ov- r :next July :.ill be u:bcut 2 3 million (' r 1 c.
year earlier was 497 million bushels. ly from 1924 to 1933, largely as a result cf~increased acreage. crease in one y oar of about 750 million bushels. sharply, lar, ly as a result of measures taken I: impnrt in. .crth Amt:rica, and the 1935-36 short Southern Hemisphere crop. ing to the Paris office of the United States Department of Agriculture. .. -; 'i f, f "' :. :> i reolti -~ in 3:vi nt L.Ci. y j and China. ./ Differs frrm f: ircs in table 16 by including only old crop wheat. Table 16 -h.ws the estimated world -'ir.rly and di-iDearance -ir.ne I'32. million, and for Australin 88 million .u'hI:s.
: Mil. bush. Mil. bush. Mil. bush. Mil. bush. domestic utilization for the year, minus monthly exports to date. and 400 million bushels in excess of probable imports. with those from the United States. a rain of 2 percent over the acreage sown for harvest in 193g is indicated. to be 3 percent .-.ve that of last year. of the reported swings up to January 1.
to b- 85 percent of n-rmal. average. Prospects in the United Kingdom are, on the whole, satisfactory. Hemisphere countries resulted in some rise in prices. practically the same as in early 1938 despite a surplus 2-2/3 times as large. of May futures at Winnipeg, Liverpool, and Buenos Aires are shown in table 6.
j.ri:.- the 10 years 1.-' -.57 ve' :-ed about 6~"' million '..'.els. table 12, and the July-December estimates of disa :. arrance by classes in table 5. --.m much l'r -r than the small stock>: on Janua :r" 1, 3'..
and flour made wholly from 'rncstic wheat. ./ B lancing item. for the. sl son to Februairy 11.
lowered foreign markets, inclu2ir.- inmroved prospects for our winter wheat crop. c.oem to indicate that domestic prices are high compared with prices in forei!-. nrco,r.-i. accounts for this favorable situation. continue to affect wheat rices drin::- th nexti few months. and wil'1 total 28 cents )er ibushel. *: C t.. o t. Ct Ct. Ct. st. Ct. Ct, Ct.
Conv;rsicns at noon buyingg rate of changeg. and January 1539, to date. January 7 to February 1S, 1 ] 3 nnd corresnonOin:,- dates for 1933.
:ar ... ,rs .. 7- r-:- W7i 1u ter:' : D m. te : + . Jan. 1 ".4 72.6 102.7 70.9 127.0 7-7.7 .7 72.7 1' .2 7.4 ','.9 7. 11 : !-,2 ?, 1':2. 68,5 124.g 77J7 110.1 70.8 100.2 73,3 90.3 . / We:'kly avera e --' daily -ash quotations, basis :'o. 1 sacked. 2 January 7 to ?eb:-. ry 1L, 1939, and corresonding dates for 1938. -Ar.! TCOfz "' -' .^.. 'EAT 1! crop is valued at the ever, o p-ice received from sales during the cal -.::. r :ear. year income is the sum of the mon'.17. inc men for the 12 calendar -ea.r months. The Ur._t.- States estimate I f income is the sum of the State estimates. j T? ':en from "Income Parity for A-riculture, Part I F'rn Income, S.-ction 5.
in the --, -year record. exceeded the pre-'.ar aver--. of 1910-14 for the first time since 19:"..
ditions may be noted particularly in the years 1930-35.
wheat, do.me-tic prices advance relative to prices in imr.ort.g countries. and been on en i-. :.ort basis. r'.-: -s in domestic supplies. in accumulations of lar'c' stocks in this country .L-d in some forei.-. lower prices eand lower i..cc -'. THAN BY THE QUANTITIES OF WHEAT FOR SALE IN THE UNITED STATES. Weighted by sales in each State. SWeighted by home consumption in each State. ear Exports and shiments "
I ^ e I ']: F- .e- ,rIi. 1 1923 to 1926 Bradstreets, excluding country elevator stocks. SIncludes durum wheat returned from Montreal estimated at 1,500,000 bushels. For 1937 excludes 7,11,,-'.' bushels new *heat; for 14-' excludes 6,1l'.000 bushel new wheat. reported as new wheat by Bureau of Cenrus. 1/ Shipments rre to Alaska, 1Hawai, Puerto Rico, and . 'ir,_-r Islands (Virgin Islands prior to December 31. 1931 included vlt th domestic exports). 2/ For Individusl iteLn see eu ply nect on. Bureau of AgrI eil t irrl Sr. nor ms.
what, wheat p.ayinr; a duty of 10 percent ad valorem, nnd flour in t :rms of wh'.t. and flour made wholly of domestic wheat. ,Z Balancing item. tnb for 1931 and 1932, and february 1938 for thoae for 1933. Telo I.-W.heat ---ocKs in th9 United t -,t tus, -Janusr 1, 1935 to 193"
:livetcck : home use or. qu;ntities o': puirc.hn-. : i wheat are so utiliz--i.
Mil. Mil. Mil. Mil. Mil. Mil. Mil. Mil. Mil. 1922 : 647 847 705 1,050 616 3,218 1 3,866 3, '.9 ? 1925 : 573 669 701 1,4o4 622 3,396 27 3,996 3,343 10? 1/ Excludes U.S.S.R. and China. Southern Hemisphere harvest which begins late in 1938 and ends early in 1939. / Deflated by Statist Index (1910-14 = 100) and converted at par. :Mil .-u.Mil.bu.Mil.bu.Mil_.bu.Mil.bu.Mil.bu.Mil.bu. : il.Iu.Mi 1 .bl.M.II. b-u.Mil .bu. : 16 /. ... 1 ..... ........ 7 . I! Includes flour milled from Can&dian wheat. Colom:li- from 1931 to 1938. 3J Includes Hong Kong, Kwantung, and Chosen. 4/Less than 500,000 bushels. Source: Bureau of Agricultaral Economics, United States Department of A-riculture. 2/ Less than [00 bushels. Compiled from official records of the rlureau -if Fcreign and Domestic Commerce. I/ Includes flr'ir milled in bond from foreign wheat. 2 7rrn-r..hll's Corn -Tr -.ie .'ws. clarances of wheat, arn estimates of flour ship.r.mnts. l! Tr.-u. Febr'nr:,' 4 only. Official r:--rts received from 16 principal ports only. ioes not include itc-r'., 2 ir.l 3. 1/ Data for total exports from the United States by weeks are not available. These data represent exports through 16 of the principal ports. ComrlT.ni from Broori.,ll's Corn r-f-de News. 5/ Less than 500,000 bushels. / Net exports of less than 500,000 bushels. Corr.ille1 from official sources except as otherwise stated. In this issue, table 9. Footnote: Change Ala# to Okla.
193715 1 8 2l (4) 5 228 40 1 -12.
;...crli,;edr r:,n'eo;';.t revision" ; yid .di..:. i ^:. r c.ine *h.-. In this issue, table 16. 12, 1934, and December 12, 1933 to end of table. li. :t of c :....-es and .1 litions in tables cb.' I 'l- wi:eat ':. rts i.
:a-:o 13, last line, fourth item: Chlixre from 704,022 to 648,322. Paj- 15, upper total, fifth item: Change from 760,31-3 to 761,343. 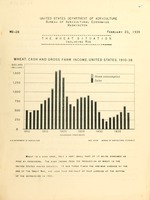 Page 16, sixth country (C .:a..Ua), first item: Change from 226,277 to 266,277.